Bummer. 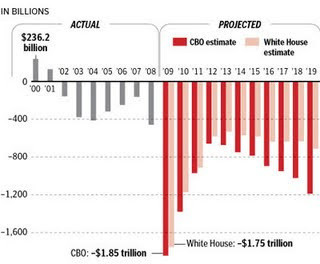 Obama and democrats spent billions this year on their stimulus plan and all we got was another trillion dollars in debt. It looks like you can’t spend yourself out of a recession, after all. A new study released today shows that the massive stimulus spending programs have produced little if any positive growth. However, tax cuts have proven to boost economic growth. The effects of tax rates on GDP growth can be analyzed from a time series we’ve constructed on average marginal income-tax rates from federal and state income taxes and the Social Security payroll tax. Since 1950, the largest declines in the average marginal rate from the federal individual income tax occurred under Ronald Reagan (to 21.8% in 1988 from 25.9% in 1986 and to 25.6% in 1983 from 29.4% in 1981), George W. Bush (to 21.1% in 2003 from 24.7% in 2000), and Kennedy-Johnson (to 21.2% in 1965 from 24.7% in 1963). Tax rates rose particularly during the Korean War, the 1970s and the 1990s. The average marginal tax rate from Social Security (including payments from employees, employers and the self-employed) expanded to 10.8% in 1991 from 2.2% in 1971 and then remained reasonably stable. For data that start in 1950, we estimate that a one-percentage-point cut in the average marginal tax rate raises the following year’s GDP growth rate by around 0.6% per year. However, this effect is harder to pin down over longer periods that include the world wars and the Great Depression. It would be useful to apply our U.S. analysis to long-term macroeconomic time series for other countries, but many of them experienced massive contractions of real GDP during the world wars, driven by the destruction of capital stocks and institutions and large losses of life. It is also unclear whether other countries have the necessary underlying information to construct measures of average marginal income-tax rates—the key variable for our analysis of tax effects in the U.S. data.